Enjoy the ultimate in comfort with these foam-padded, canvas chairs and built-in ottoman! 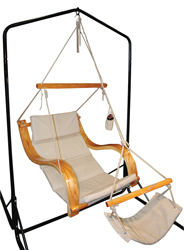 Hang from a tree or use our specially designed Hammock Stand (14-1784). Stand sets up without any tools and holds up to 330 lbs. Chairs are available in 5 designer boxes. 1 per box.